My new online photography course Photography Masterclass is meant for the person who just got a DSLR, is about to get one, or has had one for a while but never took the time to thoroughly master it to the professional level. The course contains 26 videos (11 hours total), an equipment guide, and bonuses. 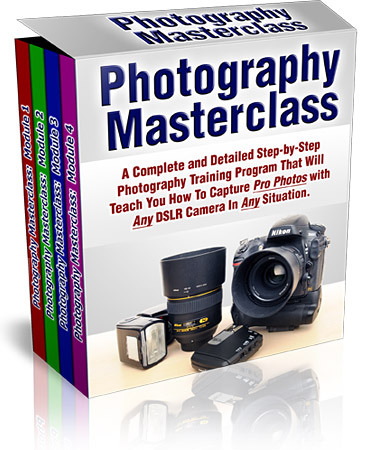 If you know nothing about photography but want to get up-to-date to the pro level as quickly as possible, this is for you. The course also has a 60-Day 100% Money Back Guarantee. If you aren't satisfied in the least bit for any reason, just email me and you will receive a full refund, no questions asked. The link seems dead on the course page. it won’t allow people to add the course to the cart. Yap CJ… it was posted long time ago. Admin should update this one. Thanks Clipping… Did you get the course? was it worth it? is there a legal reason that it’s not up and working anymore? Yeah, I’d also like to know any update about this, whether or not there will be a new course etc. Could you be more specific or perhaps leave a screen shot of what you three are seeing? The video guide has been online, up and running for almost a year now. The only thing I can think of is that, if you are clicking the Add To Cart button and are getting a blank page, perhaps your country is blocking ClickBank.com or ClickBank doesn’t accept payments from your country. If you ordered the course but weren’t able to get inside the members area for whatever reason, send me an email me with your receipt number if you are having any trouble and I will manually create a new username and password for you. I bought the Tricks of Photography E-Book. How do I access it ? I have a user name but I don’t know how to access it or download it. hi, i am from bangladesh, how can i pay for this, here paypal and other moneytransfer agencies not working, what other options have to pay? please let me know. The book needed to me because my first and last aim be successful photographer. Thanks for a brilliant reference. Thanks……. Hey all awesome tricks you have shared with us! Thank you! Hey awesome tricks and techniques you have shared thanks! I don’t see anything new by you. Are you still around? Would you have anything new for me? I love doing the tricks. I have a photo of multiplicity that I would like to share with you.